Postmarked in 1912, this postcard shows the YMCA – Young Men’s Christian Association – building that was located on the southwest corner of 3rd Avenue and 19th Street. Its style is Richardsonian Romanesque, as were many of Rock Island’s early schools, and it was designed by the same local architect who designed those schools – Edward S. Hammatt. Excavation for the foundation began in 1889, but it took until 1891 to open four rooms. Construction proceeded slowly because it was necessary to raise funds by subscription, which took a great deal of time. The building was finally dedicated in 1894, thanks to over 650 donations, ranging from 25 cents to $5000. Old Lincoln School (7th Avenue at 22nd Street) was completed about the same time, and shared many similarities with the YMCA, especially the square tower, the massive stone entry arches, and the high stone foundation. The postcard shows a large clock mounted on the corner. However an early photo from Picturesquesque Tri Cities, published in 1902 shows a second enormous round clock mounted inside the entry arch. Notice, too, the slanted glazing on the second story of the building at the right of the postcard. This housed a photography studio. The interior layout of the building is interesting by modern standards. A gymnasium was located in the basement, while the main floor contained reading and reception rooms, as well as the YMCA office. The second floor held the YMCA hall. Several rooms were also rented for private offices, likely to help defray operating costs. The YMCA movement was formed in 1844 in London, England, by young businessmen in an attempt to combat the idleness which led to gambling and drinking in other young men. The YMCA was intended to provide an alternative to such activities – a place for Bible studies and prayer meetings. YMCAs proved very popular in England and, by 1851, began to open in the United States. Although founded primarily for passive pursuits, the latent energy of its young patrons probably necessitated a change in the scope and variety of YMCA pastimes. 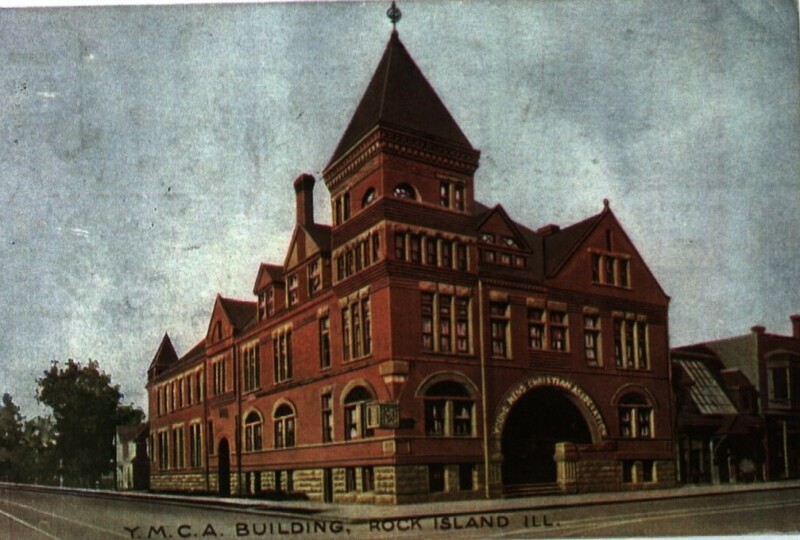 Late in the 19th century, buildings with gymnasiums, swimming pools, and auditoriums, as well as libraries and hotel-type rooms were erected by many local YMCAs. Unfortunately for our postcard YMCA, it was functionally obsolete even before it was completed. A YMCA instructor in Massachusetts invented a version of basketball in 1891. It involved elements of football, soccer, and hockey, and the first ball used was a soccer ball. Teams had nine players, and the goals were wooden peach baskets affixed to the walls. Volleyball was invented a bit later in 1895, also by a YMCA leader. The basement gymnasium in our YMCA would not have been high enough to accommodate these games as they evolved. The final straw for our YMCA was likely in 1906, when the national YMCA launched its first Water Safety and Learn-to-Swim campaign. How could a swimming pool be added to this building? The limitations of this beautiful building for athletics finally led to construction of a new YMCA building, at the corner of 20th Street and 5th Avenue, which was occupied in 1913. For the subsequent six years, this old YMCA was rented to the Marron Manufacturing Company and the Electric Construction and Machinery Company, both of which had the same officers. Sometime before 1915, the top of the square tower was chopped off. Ironically, although the Richardsonian Romanesque style was intended to convey stability, strength and endurance, it took only a 25 year lifespan for our YMCA to fall to the wrecking ball in September 1919. Nobody cared about this building, and the site had been purchased for a new theatre, to be known as the Fort Armstrong Theatre. But that’s another postcard. This article, by Diane Oestreich, is slightly modified from the original that appeared in the Rock Island Argus and Moline Dispatch on July 29, 2001.